Description: Indian Territories in the area bordered by Kansas and Texas. Original printed colour. 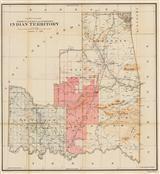 Description: Miniature map of Oklahoma when it was Indian Territory. Inset view of American Indians hunting bison. Printed colour. Description: Large road and railway map of Oklahoma divided and coloured by county. The eastern, uncoloured portion is still designated as Indian Territory. Railroads are marked with red numbers according to legends in the lower corners. Printed colour.